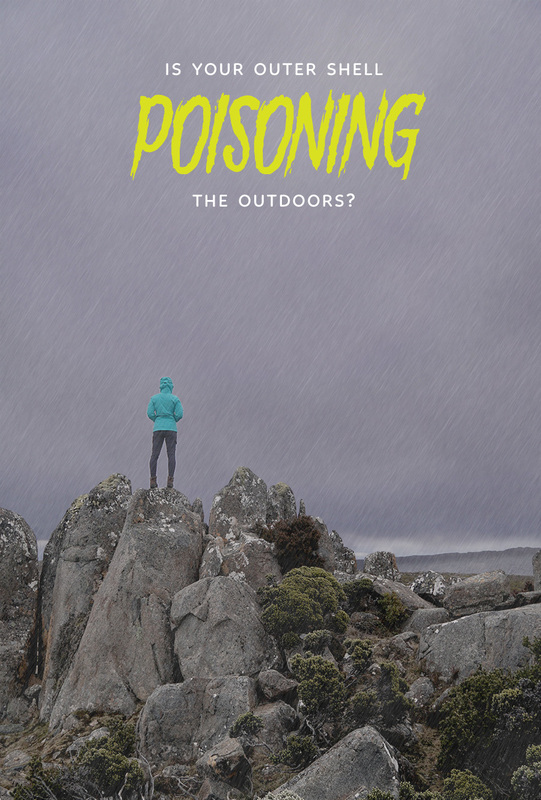 Is your waterproof gear poisoning the outdoors? Are you as amazed as we are at how well your breathable rain jacket keeps you dry? How can something that breaths and is so light possibly be waterproof? Well you have a kind of magical chemical mixture called PFC to thank for that. Unfortunately, it’s becoming more and more clear that PFCs are slowly poisoning the planet and you with it as well. PFCs or Perfluorinated Compounds are essentially a cocktail of carbon and fluorine. For years outdoor brands have relied on long-chain PFCs, also known as C8 (because it contains 8 or more carbon atoms), as the base for their Durable Water Repellent (DWR) finish. It does an amazing job at not only repelling water, but also dirt and oil. In time, dirt and oil, will become responsible for allowing water to saturate your shell and eventually make you wet. So it’s important to keep that off your jacket. It also lasts an extremely long time, giving your garment an unusually long life. Which is a good thing! Right? Long lasting jacket means you need to buy a new one less often, which saves the planet of excessive trash and the greenhouse gasses released making new jackets. Unfortunately, the production of this C8 DWR is responsible for the release of tons of toxins and greenhouse gasses. PFCs get mixed in with the water we and wildlife drink. It’s found in the fish you catch, the livers of endangered wildlife we’re trying to protect and even in the snow and water sources of some very remote places on earth. It messes with the hormonal balance of humans and animals alike. Studies have shown that PFAs (a type of PFC containing 8 or more carbon atoms) negatively affect the development of foetuses, decrease fertility and increase the risk of cancer. Among other things. It is highly polluting in terms of greenhouse gasses. During my research I’ve come across different sources claiming parts of PFCs have a Global Warming Potential (GWP) of anywhere between 5000 and the highest I found was 12200. To put that into perspective, let compare it a gas you’re probably a little more familiar with: Carbon Dioxide. As the most common greenhouse gas it is the base point which all others are compared to. Therefor it has a GWP of 1! This means PFCs are potentially 12200 times more polluting than Carbon Dioxide! And last but not least, PFCs are persistent. Very persistent! They stay in our system for many years and in the environment even longer. Yep. It’s pretty much terrible. And not just for the environment, but for you as well. Than why do Outdoor Companies use it? Long-chain PFCs are starting to get phased out by many countries around the globe, among them is the US (where many of you, our darling readers come from) and Australia (our home base). They were simply to toxic to keep around. However, many outdoor brands are still widely using a shot-chain alternative known as C6 (containing 6 carbon atoms or less) arguing that any non-perfluorinated alternative simple doesn’t keep dirt and oil off, shortening the garments lifespan significantly. Patagonia talks about this very compellingly in this article. And we respect that. If garments actually do become useless at their task in a short amount of time, this would simply lead to new kind of pollution. Although the C6 DWR is less toxic than old fashioned C8, it is still a toxic product that is poisoning the planet and needs to disappear altogether. Any product that is advertised as waterproof or oil resistant that contains a surface which isn’t naturally so, will likely contain PFCs. Think non-stick pans, any clothing coated with a DWR finish, fabric furniture, certain types of food packaging. Just to name a few. Before you make a big purchase, enquire with the company if the coating they used contains any PFCs (long or short chain) and consider rejecting the offer of having your new sofa sprayed with a water proofer. Does this mean I should throw away my old waterproof jacket? Please, God, NO! Don’t throw away your jacket. Love it as you did before reading this. Cherish it and take good care of it to get the most out of its long life. The toxins linked to any PFC coating are pretty much all released during the manufacturing process. There’s no evidence that wearing a DWR jacket containing PFC is bad for you or the environment. The only time after buying it you are doing serious damage to the planet is when you throw your stuff in the bin. So by all means, keep using your jacket. We will! Enquire about the coating before buying something new. Spread awareness. Share this post, tell your friends, get the word out. Sign this petition for Detox Outdoor, an initiative of Greenpeace. Also, make sure to read through their FAQ page to find out more on PFCs and the environment. What’s your opinion on the matter? Do you agree with many outdoor brands to keep using C6 DWR finishes until an equally good product is on the market? Or do you not mind the risk of getting wet (even on longer expeditions) to spare the planet from nasty chemicals? Tell us all about it in the comments below. And for convenience of fellow readers who care about the outdoors, be sure to mention any DWR treated gear you find that’s PFC free. Disclaimer: I’m by no means a scientist and the article here is simply my interpretation of the extensive research I’ve done on this topic. If you want to learn more about PFCs, please make sure to click on the links scattered throughout to check out the sources I’ve used to put this post together. Thank you!